The data taken for this study is obtained from the official website of Hyderabad Traffic Police (http://www.htp.gov.in/Default.htm). Also note that the data for 2014 covers only the period until April. 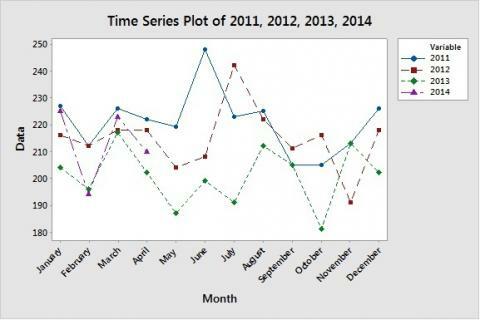 Reviewing the time series plot I obtained using Minitab Statistical Software indicates that the number of accidents steadily decreased every year from 2011-2013, but there seems to be a rise from January-April 2014. 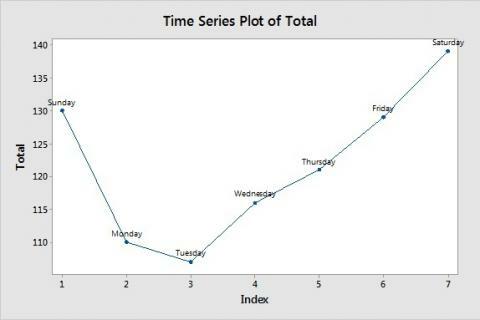 Following is a time series plot of the 852 accidents that took place from January-April 2014 according to the days of the week. This graph clearly indicates that the number of accidents occurring over the weekends is high. The increase in the number of accidents over the weekend is a serious concern which requires attention since these accidents may be preventable by awareness campaigns targeted to the youth of the city. Make citizens aware of the importance of strictly adhering to the traffic rules, and impose fines on those who do not abide by them. Issue driving licenses only as per age limits, and only after the person clears all the tests. Inspect vehicles to make sure they are road-worthy. Increase the number of traffic police in areas of heavy traffic. Make sure the timers installed at traffic signals function properly. 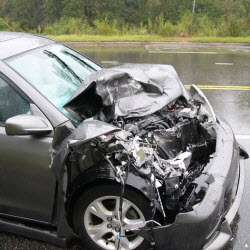 Analyze the major accident-prone areas scientifically to reduce the rate of occurrence. Check medians, footpaths, and curvatures carefully. Use paint to clearly mark humps on the roads. Remove attention-seeking boards, banners, and advertisements.